Tim O’Brien’s work The Things They Carried is SO MEATY that an entire course could be designed around it. How do we teach it well without sacrificing the good stuff? Is it fiction? Is it non-fiction? Is it creative non-fiction? Should I focus on analysis? Interpretation? Expository writing? Creative writing? Should students read outside of class? During the class period? 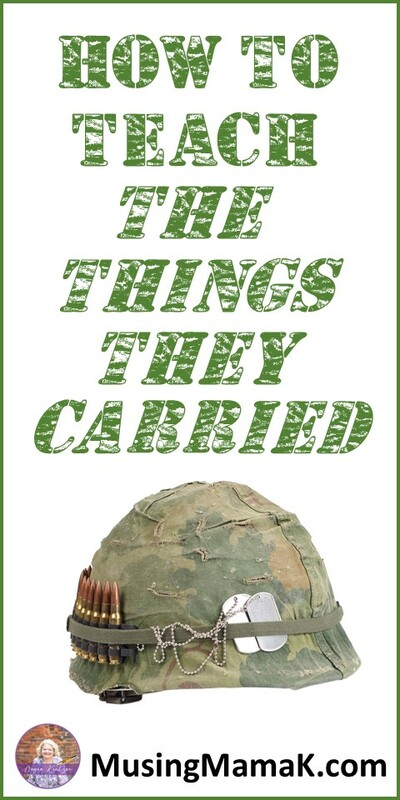 There are so many ways to approach Tim O’Brien’s The Things They Carried in the classroom. I’ve tried two. Students plow through the whole book outside of class (in my case as summer reading) because it’s high interest enough to avoid too much resistance. Students have a deadline, take a did-you-read-it assessment just for accountability, and we dive in to the analysis of some select passages and wrestle with the themes and theses of the work as a whole. The advantage to this approach is that we don’t beat the book to death. One disadvantage is that students are on their own through a pretty harrowing narrative. Another is that we walk right by a diamond mine of material through which we could be teaching a whole host of skills. I like diamonds, so I lean now toward a more thorough treatment. Assign the reading in chapter chunks, most of which are completed outside of class with one or two in-class silent reading days sprinkled in. Spend one to four days on each chapter set and do it right: address one specific rhetorical mode by learning to write in it and about it as a strategy and as a device. Look at character, symbolism, and theme like it’s a work of fiction and apply a non-fiction lens to the same work and look at O’Brien’s rhetoric. A teacher on a block schedule might use this work as her one “novel” of the semester. This 34-page unit contains five lesson plans (60-120 minutes each), eleven handouts, one reading quiz, and four versions of a map of Southeast Asia. Materials focus on student understanding of the Vietnam conflict, analysis of symbolism, and writing and analysis of essays in the definition mode. This 19-page unit deals largely with the use of the narrative mode. This 13-page, two-lesson mini unit focuses on theme and the descriptive mode. This 20-page unit contains three lesson plans (60-120 minutes each), eight handouts, and one reading quiz. Materials focus on motif, non-linear narration, and the comparison-contrast mode. This 14-page unit contains one multiple-day lesson plan, one reading quiz and key, student handouts, graphic organizers, teacher notes, and rubrics. For good measure, just in case a teacher wants to use Approach 1 and pick and choose from Approach 2, I included a did-you-read-it test as well. So there we have it: 132 pages, 17 detailed lesson plans, 37 handouts, one reading test, eight reading quizzes, with teacher notes and keys for everything. If a teacher plowed straight through this material, he would have six to eight weeks of material, all of which is aligned with both Common Core State Standards and the requirements for AP English Language & Composition. To learn more about approaches to rhetorical analysis, check out this blog post.